High-level segments (HLS) of the UN Human Rights Council (Council), held each year during the first week of the Council’s main session in March, have their detractors. Critics argue, not without some justification, that the political speeches by assorted presidents and ministers present an otherworldly picture of the situation of human rights around the world, detached from reality and premised mainly on giving governments a public relations fillip on a global stage. While such arguments may contain some truth, one way in which Council high-level segments certainly are useful is in offering a barometer of international interest in human rights, and international commitment to the Council and the wider UN human rights pillar. This can be roughly gaged by the number and the level of high-level speakers travelling to Geneva. A second, and more significant way in which HLSs can be useful is by offering a snapshot of what world governments see as the key human rights challenges, opportunities, and priorities for the international community in the year ahead. With regard to the first point, the high-level segment of the 34th session of the Council (HRC34), which ran from 27th February to 1st March, saw the participation of over 130 high-level State dignitaries, including 2 heads of State, 61 ministers and 32 vice ministers. That such a large number of senior State representatives would take the time to travel to the Palais des Nations and deliver speeches, suggests that governments continue to see the body as an important part of the international political architecture, and that they continue to see value in using it as a platform to present their national position and views on human rights. 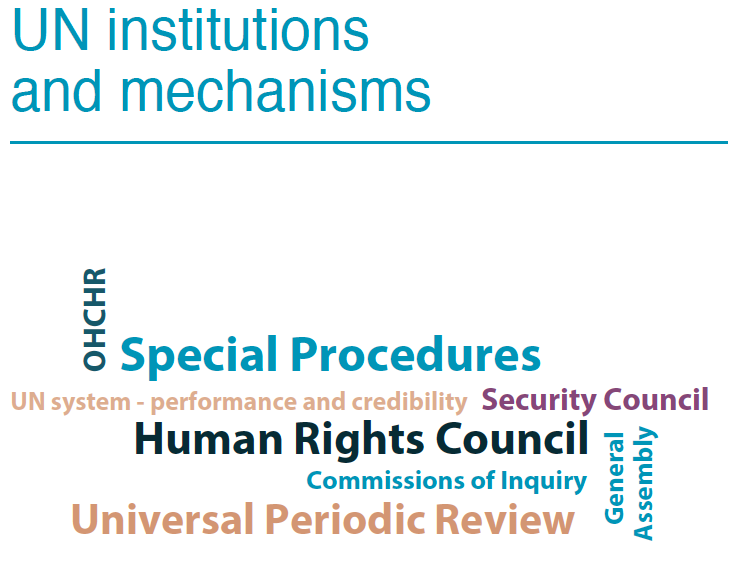 On the second point, in order to use the content of those speeches to provide a snapshot of what world governments see as human rights priorities for the year ahead, URG monitored and analysed all 134 high-level statements during HRC34 to identify key themes and ideas presented by State representatives. URG’s analysis found that the 134 speeches contained references to over 2370 human rights topics or subjects. When clustered, it becomes clear that the 134 speeches addressed around 160 broad themes. 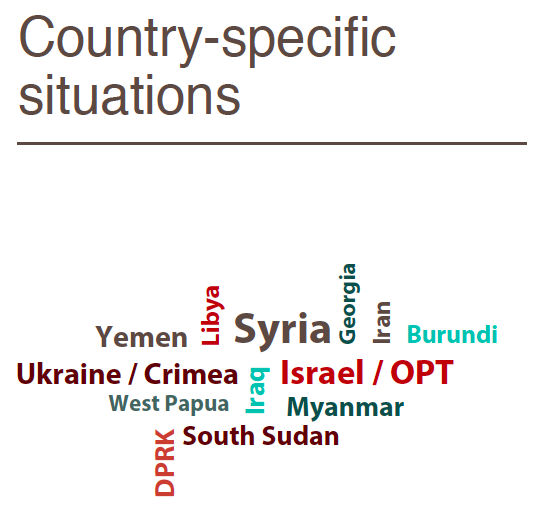 To identify key themes for 2017, URG counted the number of mentions of those broad themes across all high-level speeches (only themes mentioned by at least four different State representatives were included in the final results). The results of the analysis are presented below in a series of ‘word clouds’ (with the size of the word reflecting the total number of mentions of the relevant theme). 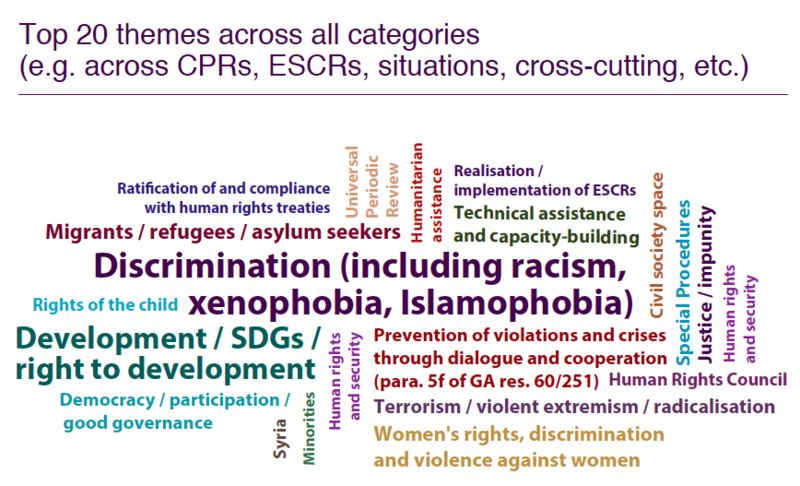 URG has generated word clouds for: economic, social and cultural rights themes; civil and political rights themes; ‘groups in focus’; cross-cutting/other topics; country or regional situations; and ‘institutional’ themes related to the UN human rights mechanisms. Finally, URG identified the ‘top 20’ most frequently mentioned themes. These are presented in a separate word cloud. The most widely referenced human rights topic, by governments in 2017, was ‘discrimination.’ This included references to racism, xenophobia, and religious intolerance. 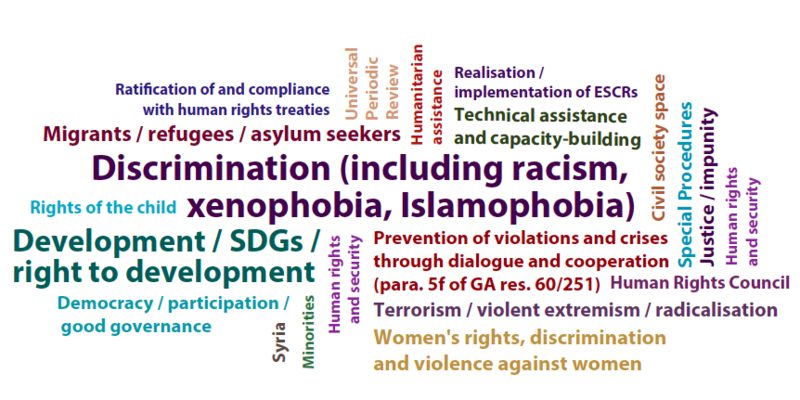 Other key human rights issues and priorities for 2017, according to high-level government representatives, include: ‘human rights, the Sustainable Development Goals and the right to development;’ the rights of migrants and refugees; the need to strengthen the Council’s prevention framework in line with its mandate under paragraph 5f of GA resolution 60/251; reform of item 10 and the UN’s deliver of human rights capacity-building and technical support; violent extremism, radicalisation and terrorism; democracy and good governance; and women’s rights and violence against women. 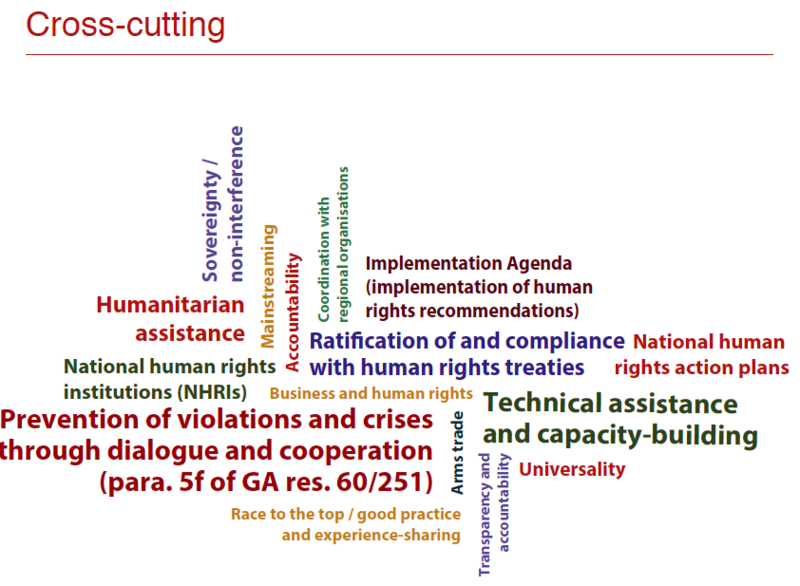 Looking at cross-cutting / horizontal human rights concerns, State representatives drew particular attention to: building a human rights ‘Implementation Agenda,’ especially by strengthening domestic implementation and reporting mechanisms, (linked with this point, States also drew attention to the need to increase ratification of the human rights treaties); prevention; reform of item 10 and improved delivery of capacity-building support; generating a ‘race to the top’ by identifying and sharing information on positive human rights achievements and UN impact; and the role of national human rights institutions (NHRIs). Turning to civil and political rights themes, as already noted, issues around ‘discrimination’ were heavily cited by governments. 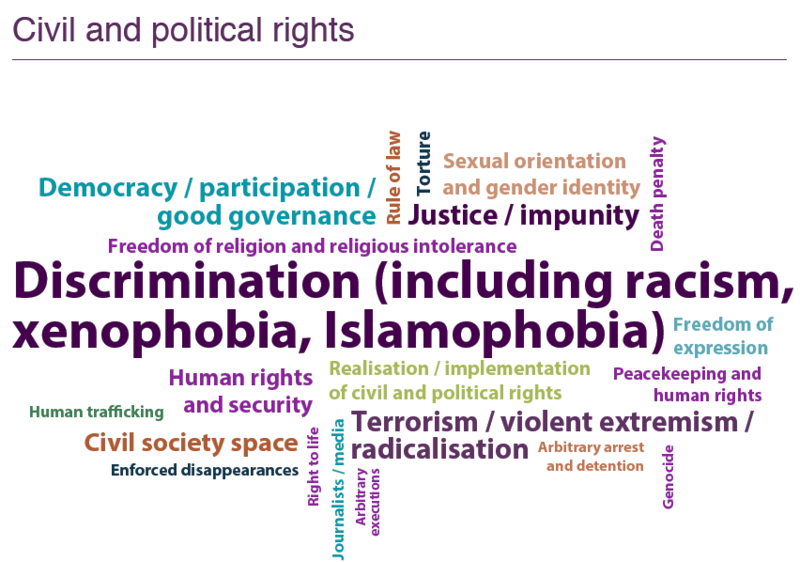 Other important themes included: violent extremism and radicalisation; human rights and security; democracy and good governance; civil society space; sexual orientation and gender identity; justice and impunity; and peacekeeping and human rights. 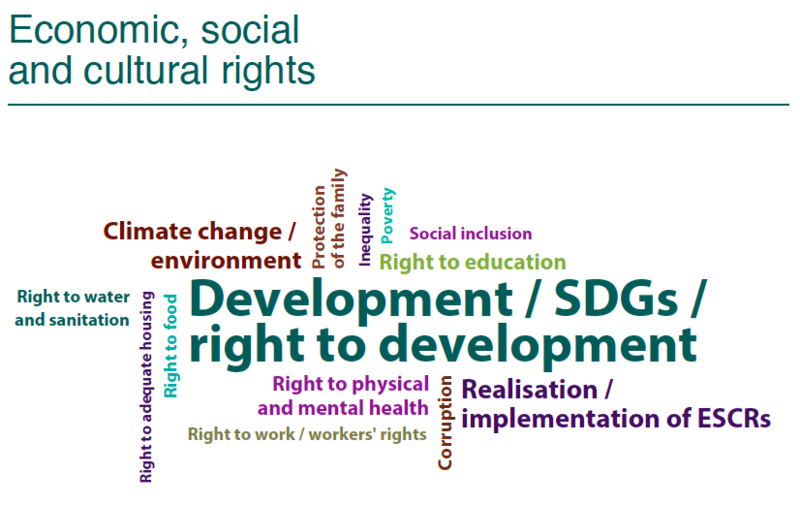 In terms of economic, social and cultural rights issues, States highlighted, as an overriding priority, the importance of leveraging human rights, including economic, social and cultural rights and the right to development, to support the fulfilment of the 2030 Sustainable Development Goals, ‘leaving no one behind.’ Linked with this, States also drew repeated attention to the importance of strengthening human rights in the context of the fight against climate change and wider environmental degradation. Other ESCR priorities for governments in 2017 include: human rights and corruption; the right to education; and the right to health. 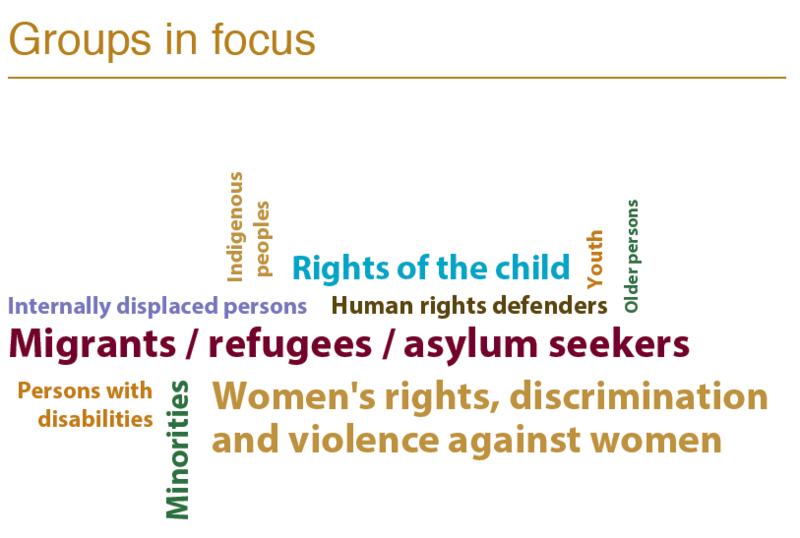 Among ‘groups in focus’ or ‘groups in vulnerable situations,’ in 2017 States drew particular attention to concerns over the rights of migrants and refugees; and to women’s rights, including in the context of gender equality and violence against women. Regarding cases of country-specific human rights violations of particular concern to the international community, States made repeated reference to: Syria; Ukraine / Crimea; Israel and the Occupied Palestinian Territories; and DPRK. Finally, a range of governments used their speeches to express support for the Council and its mechanisms (the Special Procedures and the UPR), while calling for reform and improvement in order to strengthen the UN human rights pillar’s effectiveness and credibility.